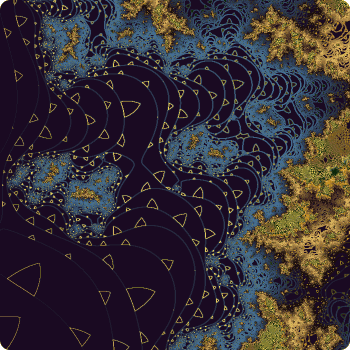 In this one the rough, irregular quality to the fractal was achieved by using the perturbation feature. This does something to the calculation of the formula which gives the resulting image a smashed or blasted look. For my purposes, using edge detection, it produces areas which have great diversity in them and not the usual monotonous patterns a normal calculation produces. One of my first experiments with the perturbation feature produced an image which looked like a mandelbrot with its head blown off. Others were more like pieces of broken china.